Arrive Aswan; Visit Philae Temple , High Dam and enjoy walking in Aswan Bazaar. Upon arrival to Boat, the Captain and his crew will welcome you on board Amoura Dahabiya and you will have your bags taken to your cabins. 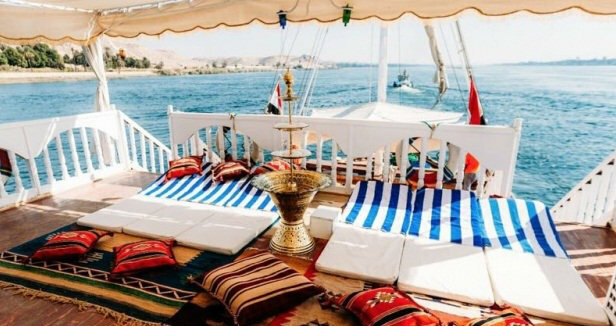 Lunch will be served on Board, then We will then have a charming sail to Esna . as we sail on to Kom Ombo. Listen to the sounds of the water buffalo as they wade in the shallow water besides the banks of the Nile, the Donkeys as they go about their day to day business and the various bird life of the river. Breakfast at your leisure. Here we visit to the Greco Roman Temple at Kom Ombo. The temple building is totally symmetrical with two entrance's two halls and two sanctuaries dedicated to the Falcon God Haroeris (Horus the Elder) and the Crocodile God Sobek. We set off for the relaxing journey to the temple of Gebel el Silsila, another of our less frequented destinations. You will be amazed as we tie up alongside the Speos of Hormheb. If possible dinner will be served in the grounds of the illuminated temple or on the upper deck whilst soaking up the tranquil atmosphere with music to match the mood. Enjoy breakfast at your leisure, visit Edfu Temple by horse carriage, one of the largest and most intact of Egypt's monuments. Two beautiful granite statues of the Falcon God Horus flank the entrance. After your visit to the temple, either ride or walk through the bazaar, this is an extensive bazaar where you can barter for souvenirs, spices and perfumes. We will then set sail to an island where we will disembark to get dinner served in the edge of the Nile according to weather status or dinner will be served on Sun Deck. Preparing for our EGYPTIAN EVENING OF FUN, with Egyptian cuisine, Arabic Music . Dress in your bespoke Gallabeyah or belly dancing outfit. we gently sail en-route to Esna, Overnight Esna. After breakfast, we bid farewell to Captain Hassan and the crew. Your luggage will be collected and will be ready for you to travel to Luxor , Sightseeing in Luxor to visit the Valley of the kings, Hatshepsut Temple, Colossi of Memnon , Karnak Temple.